I've mentioned before that I listen to a lot of podcasts. It's true, really. Anyway, my favorite one definitely has to be ExtraLife Radio (ELR). The ELR show is hosted by Scott Johnson, and before Scott was creating podcasts he was writing and drawing a webcomic. He still has a webcomic, and one of his recent drawing projects has me extra excited. He's calling it "The 56 Geeks Poster." I'm not sure why he settled on the number 56 (isn't 42 geekier? ), but he's making a poster of 56 different types of geeks. I love the idea, and the images he is churning out are cracking me up. If you want to see what he has already produced, you can visit his Flickr set. So far he has created 35 geeks, and once he is done he will start selling them in poster form. I talked with Scott, and his original goal was to sell them for less than $30 depending on what kind of deal he could get from a printer. He is taking pre-orders at the price of $33.99 including shipping to the continental US. As long as the quality of the print is good, I feel that $34 is a fair price. If his next 21 geeks are anywhere near as great as the first 35, I am definitely going to get one of these posters one way or another. If anything, I should help compensate him for all the great free content he provides and I consume. 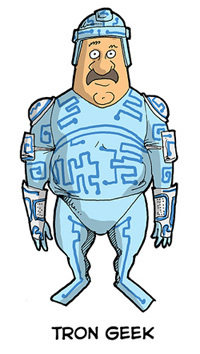 If you can't tell, so far my favorite is the Tron Geek based loosely on this guy. In what world is $34 a reasonable price for a cartoon poster. When I think of poster, I think of the $12.99 posters at Wal-Mart! Why can't you want one of those? Did you see the Tron Geek?